This living space is built using sweet chestnut from local woodland, and green oak wall plates and rafters. This structure creates a beautiful open space where the family can enjoy eating and relaxing outside under shelter, an extension of the home, and connecting with the garden. It is used by the whole family. The oak was planked at a local sawmill with oak from forestry commissioned felled trees. We built two oak sky lights, battoned the roof with pine and fixed red cedar shingle roof tiles. We also used oak to build the benches and fascia, and sweet chestnut for the hand rails and panel cladding on the side. 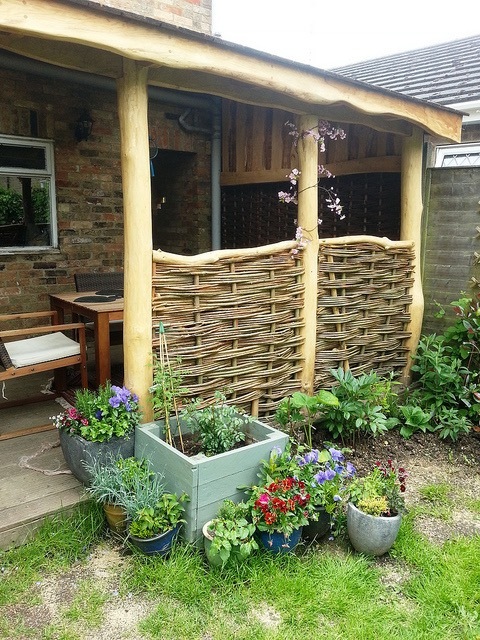 The willow used to weave the panels on the face of the structure came from a local coppice, freshly for this job.